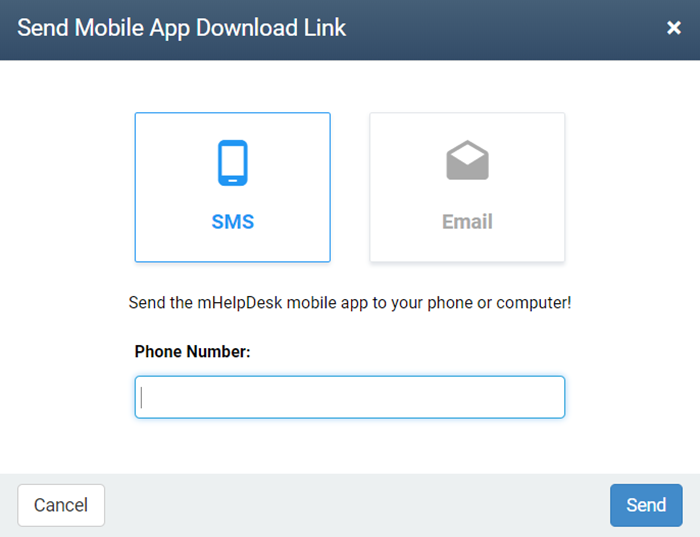 Now it's easier to download the mHelpDesk mobile app! To make it easy for everyone including techs, managers and anyone else who needs to take mHelpDesk with them on the go, you can login to the mHelpDesk web version to send a text or email with the app link to your mobile device. 1. Login to your mHelpDesk account by clicking HERE. 2. From the Dashboard home page, locate the box in the bottom right corner labeled "Let's get started" and click where it says Install the mHelpDesk Mobile App as shown below. 3. A window will pop up asking if you would like to send a text message or an email with the link for the app (shown below). Select text (SMS) or email, enter the phone number or email for the desired person. That's it! Now you have quick and easy access to download the mobile app.